When entrepreneur Gary Roberts decided to set up a business, he returned to his roots and opened a Mail Boxes Etc. store that would help make life easier for busy local residents. MBE Southend is a post, parcel and print specialist - part of a nationwide network of over 160 stores. Located at 15 Clifftown Road, and open six days a week, the new business is already thriving thanks to its central position and extended opening hours. “We’re here from 8.30am to 6.00pm Monday to Friday, and 10.00am to 2.00pm on Saturdays,” explains Gary, who was born in nearby Basildon. One of Gary’s main reasons for opening a Mail Boxes Etc. store was the range of services available to customers. 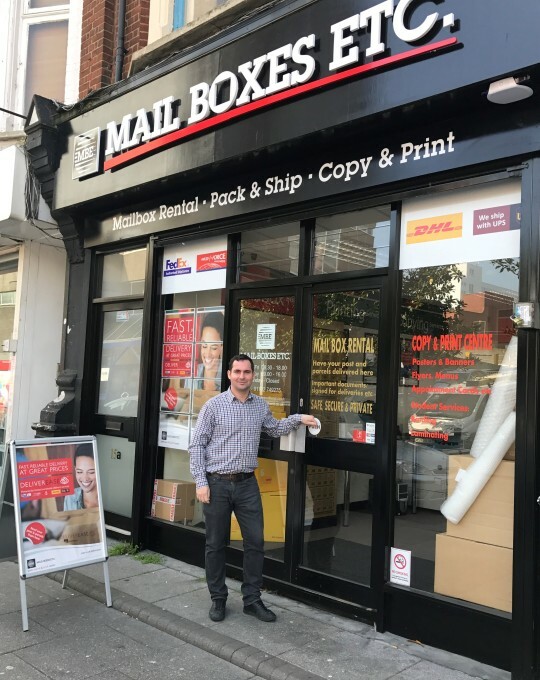 “We offer Royal Mail postal services without the queues; fast and easy parcel delivery using UPS, DHL, FedEx and other big brands; a mailing address service that’s perfect for students, individuals and businesses, and lots of extras too,” he says. The new Southend store also specialises in design and print: "I’m currently designing a company’s logo and printing their letterheads, business cards, roller banners and clothing,” says Gary, who offers collection of items for post, shipping and print: "We regularly call at local businesses, including NHS health centres, to carry out mail fulfilment and courier services. “Schools and colleges also make the most of our services by regularly requesting collections and emergency print jobs for school plays and various events. It’s great to be able to help so many customers in the community,” concludes Gary.